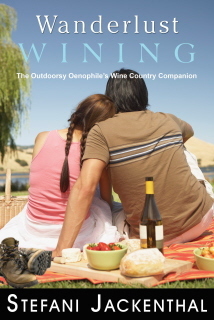 Wanderlust Wining is written by one of the world’s foremost wine and travel experts. Wanderlust Wining is a fun delicious journey through many of the America’s finest wine countries. It’s a one-stop-read to crafting active wine tasting trips in unique (and familiar) wine countries across the United States.Each chapter offers wine education and historic facts about the area’s wines. Discover how to kick off mornings with action-packed activities and spend the remainder of the day sniffing, swirling and sipping through local wineries. Learn how to taste wine like a pro and be in the "local know" about area attractions, outdoor activities, "must-go" restaurants, art galleries, markets, vineyards, and more.Stefani Jackenthal is a journalist for print, TV and radio, and president of the wine events company NTS Wine Tasting, which produces corporate and private wine tastings, dinners and educational wine series. She has contributed to The New York Times, Conde’ Nast Traveler, Outside, Prevention, Runner’s World, Marie Claire, and Oxygen and has reported for NPR’s "Weekend Edition Saturday" as well as reported on-air for TV.Cardinal Publishers Group is the distributor of Price World Publishing books.